We are a leading Manufacturer of automatic bagging machine from Vasai, India. We are one of the leading manufacturers & exporters of Automatic Bagging Machine. Clean & dust free operation. PLC Based or Semi-Auto operation. Hot sealing for a Plastic bag as well as stitching facility for Jute/cloth/HDPE Bags is available. Robust support structure will be provided. 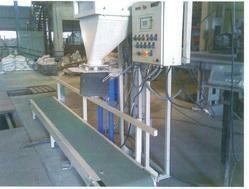 A material of Construction – SS 316 / SS 304 etc..
We can supply with feeding conveyors. User-friendly weighing indicator control panel will be provided.